Apple’s new DEP and VPP deployment programs represent a significant innovation in the practice of IT device management. Apple is well known for product innovation and consumer services. With DEP and VPP, they have taken a big step forward in the world of IT management. This is significant, and reinforces that Apple is focused on the enterprise IT market and pushing the industry forward. DEP and VPP are available today for businesses, schools, and organizations that enroll in the programs. 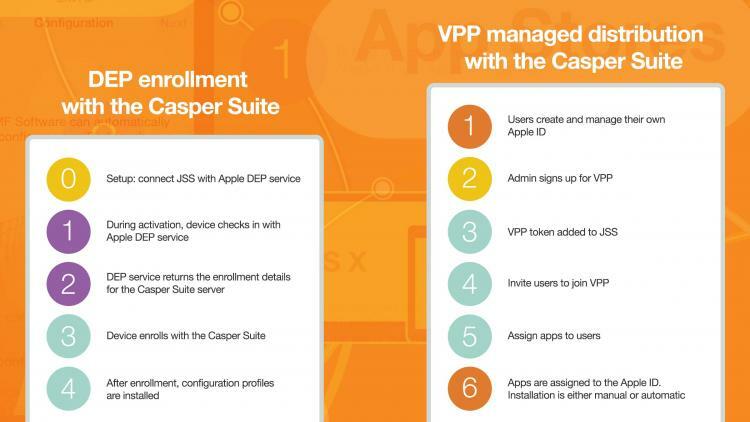 When paired with an Apple management tool like Casper Suite, DEP and VPP offer a new way to approach device setup and app provisioning. Like all Apple products, DEP and VPP are designed to offer a great user experience. From the first moment when a new iPad, iPhone, or Mac is unboxed and powered on, DEP streamlines the activation process and offers automatic device enrollment and configuration. VPP adds a simple path for purchasing and deploying software from the rich App Store ecosystem. Together, DEP and VPP offer a great user experience that is unparalleled in enterprise IT. Make sure you’re eligible and ready to enroll.